Concern over jobs has been a constant refrain in politics, business, and everyday conversation for decades, becoming even more urgent during the current economic crisis. Yet, for all the intense discussion of the subject, the local job-creation strategies pushed forward by politicians, business leaders, and economists are focused primarily on luring new companies, developments, or tourist attractions to a community instead of leveraging the substantial assets that already exist within most communities. As a result, one city is pitted against all others, desperate to offer anything—free land, reckless tax breaks, low wages, etc.—in order to beat out potential competitors. While this kind of strategy might succeed in winning a few jobs over the short term, this does not translate into genuine prosperity. From our experience working in more than 3000 communities around the world, PPS came to realize that what is missing in most discussions about jobs—especially good, green jobs—is the fact that secure jobs are intimately tied to place.This is what truly generates prosperity and well-paid employment over the long haul. “Making great places does not just mean that you are adding tourist attractions to your city,” explains Larry Lund, PPS Associate and a Chicago real estate consultant. “It’s way more powerful than that: it has to do with creating an environment that will be attractive for businesses,” places to host the dense organizational and social complexity that is vital to the success of so many industries that create and sustain great jobs. After all, cities first emerged because people gathered together at crossroads, creating busy, vibrant places for exchanging goods and ideas. Cities grew out of commerce. The same holds true today. Cities need great places that provide the settings for these kinds of social, physical, and economic interactions. This is what businesses seek as well. They want places that are attractive to employees, places where connections can happen, places that spur productivity and creativity, and where social and professional networks can foster collaboration and innovation. “Placemaking”—the process of creating great places and strong communities—is essential for creating quality jobs that are well-paying and environmentally friendly. It works like this: local people are the experts in what works best in the place they live, so bringing them together in settings like market squares, community centers, main streets, and –surprise!- libraries to think about how these places can be improved unleashes tremendous creativity and increases citizens' abilities to remake their own communities. 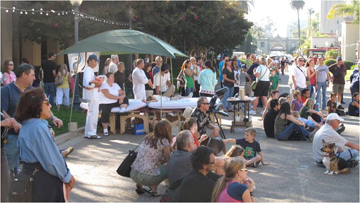 Placemaking builds the necessary foundation upon which new enterprises rise and prosper. And there is mounting evidence that it can create lasting, sustainable prosperity for communities, even in places not usually associated with good news. Consider Detroit. At the heart of the city is Campus Martius, which until recently was a small unused green space overwhelmed by the traffic that rushed past it. Despite these challenges, Mayor Dennis Archer imagined this pocket-sized park as a world-class public space, akin to Bryant Square Park in New York City, which would draw people and investment back to what had become a void in the center of what many considered to be a broken down city. 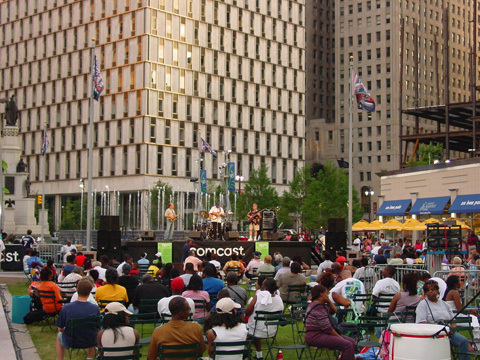 At the initiative of a new civic group, Detroit 300, an entity formed to celebrate Detroit's 300th birthday, the community began to envision Campus Martius as a lively town square—and in 2004 that vision became a reality when the park was reopened with gardens, two retractable stages for events, an ice skating rink, a café, and lots of benches so people could relax and enjoy themselves. ‍Job magnet: Compuware located 4000 employees in downtown Detroit because of Campus Martius. The transformation spurred major redevelopment which brought many new jobs and a half-million dollars in new investment in offices, shops, condos and a hotel to the city. Compuware, a leading IT solutions company, built their corporate headquarters across the street from the future park, housing 4000 employees. 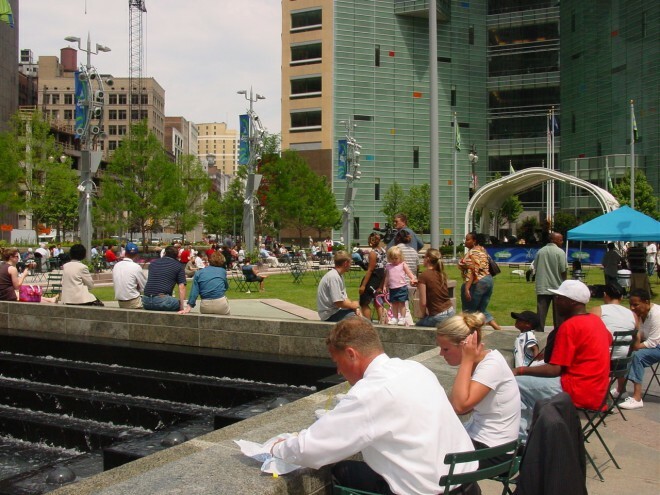 "Compuware would not have come downtown without the park," notes Bob Gregory, a former General Motors executive and head of the Campus Martius Conservancy, which was formed to manage the park. “They didn't want just a building. They wanted a lively district, where their workers would have things to do." This is a prime example of how urban districts with a vital sense of place can take advantage of changes in the way business is done. Today's employees are increasingly “thinking outside the cubicle,” working collaboratively in ways that bring them out of the office to make connections with other creative people. Accessible public spaces provide innovative workers with a setting that is conducive to creativity, exploration, and productivity on many fronts. This trend explains why downtowns and other walkable environments continue to thrive, despite warnings of two decades ago that the internet would render them obsolete. It turns out that people still crave physical proximity to others in the same field, which gives a distinct advantage to places that have a critical mass of high tech, financial, legal, media, design, advertising and other industries. All vital cities showcase at least one multi-use destination – an interesting place where people can go for a variety of activities that involve more than shopping. A multi-use destination that is the heart and soul of a community can both create an identity and generate good jobs and economic growth for that city. A great example is Granville Island, a tiny 38-acre patch of waterfront in Vancouver, Canada, that is home to a public market, Emily Carr College of Art and Design, a children’s museum, a community theater, a recreation center, local artists’ studios and galleries, a cooking school, a hotel, a boat repair and construction businesses, a cement plant (with a revolving cement truck painted like a strawberry) and a multitude of other unique and interesting uses that appeal to both locals and tourists. While it is the most visited destination in British Columbia, it also has one of the smallest budgets (just $25,000 per year) for tourism advertising of any Vancouver destination. ‍Vancouver’s Granville Island market hosts nearly 100 vendors, providing important opportunities to incubate small businesses. 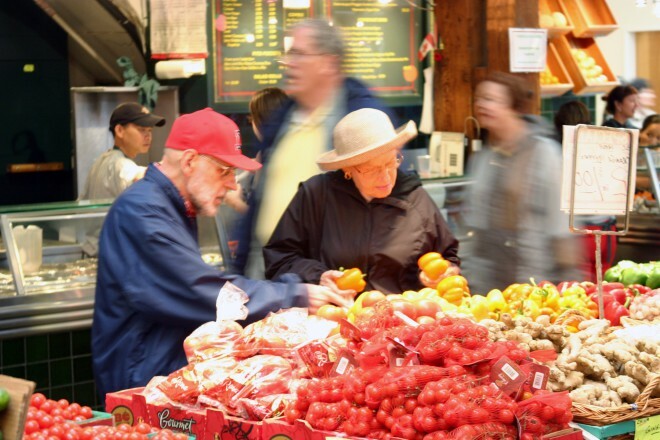 The economic anchor is the Granville Island Market which has 50 full time local vendors that sell from market stalls, including a variety of small eating establishments with many different ethnic foods, and 45 spaces for part time vendors. And there are no chains! About 3,000 people are employed on the Island and it generates over $215 million in economic activity each year. Balboa Park in San Diego is another great multi-use public destination, home to 15 major museums, renowned performing arts venues, fabulous gardens and the city’s world-famous zoo. It is known as “The soul of San Diego,” and “an economic, ecological, and spiritual engine that continuously pumps life into the metropolis.” The almost mystical qualities that make it a great destination also have real economic value. 10 to 14 million visitors use the Park each year and the average length of stay is 3.5 hours. On average, those who live nearby return about 20.5 times each year. 3500 people are employed in the park; and their work is complemented by the dedication of 7,000 volunteers who contribute to the overall vitality of Balboa Park all through the year. The same qualities of a great destination (a sense of place and belonging) that bring volunteers to donate their time are also attractive to businesses. Businesses (and volunteerism) thrive in the places that people treasure most. ‍Balboa Park, known as “the soul of San Diego,” generates 3500 jobs. People often think of both of these spots as tourist havens, with the usual low-pay, no-future tourist jobs. But a closer look shows that tourists are not the primary force behind the economic success of these places: Granville Island and Balboa Park are multi-use destinations that are heavily used by the local population. 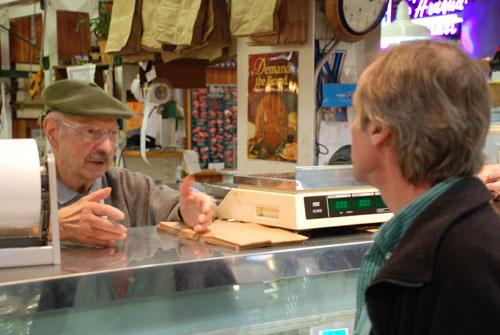 After all, at the Granville Island Market the highest-performing vendor is the meat market, which shows that it is a major attraction for locals.No one is going to take fresh pork chops home on the airplane or fry sausage in their hotel room. In fact, the market is busiest in the off-season when tourists are more scarce in rainy Vancouver. Studies have shown that even tourists themselves are more interested in an authentic experience than artificial attractions created expressly for them. All over the world travelers are drawn to places—Paris, Tuscany, San Francisco, Kyoto, you name it—with unique qualities that make these destinations interesting. The last thing many tourists seek is to mingle with other tourists. By making more appealing places for residents, you attract tourists better than if you are trying to attract tourists. ‍More than fun, public markets incubate new businesses and employment. The power of places to create new economic opportunities and employment is especially evident in the 84 percent rise in the number of farmers markets created in the U.S. during the past nine years. They are now at an all time high of 5,274. The same phenomenon is occurring in countries around the world. More than a picturesque, public-spirited, feel-good trend, markets are potent economic incubators. People go to markets not only because they can buy the fresh food they need at a price they can afford but also because markets are sociable, fun places that offer a rewarding experience to visitors. Markets are at the center of a new, New York City Council campaign, championed by Council Speaker Christine Quinn, called "FoodWorks," that seeks to create jobs from the City's food system. Sociologist Ray Oldenburg first coined the phrase “Third Place” in his book The Great Good Place, where he describes home as the “first” place, work as the “second” place, and that place where the community gathers as the “third” place - “homes away from home” – the place where unrelated people relate. Inspired by Oldenburg’s book, Ron Sher, real estate developer and owner of Sher Partners, sought to create a “third place” in Seattle where people in the community could gather and businesses could thrive. He found space in an underused shopping center surrounded by acres of empty parking lots in the suburb of Lake Forest Park. 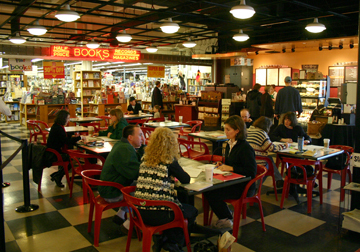 Third Place Books and Third Place Commons opened its doors in 1998. It consists of an indoor “town square” with public seating, an information desk run by volunteers, a life size chess set on the floor, and picnic tables for working or playing games. The square is surrounded by the Third Place bookstore, several small independently operated food stalls, and a stage that hosts musical and theatrical performances, public discussions and debates, and book/poetry readings. The site hosts over 1000 free public events every year. Centers like Third Place Commons add value to the community that can’t (and perhaps shouldn’t) be monetized. As a social space and a community hub, it creates the conditions for new connections and relationships to arise. The many uses within this great destination draw a diversity of people to the shopping center, increasing the potential for surrounding stores to perform better, which in turn generates good business and jobs. According to the U.S. Department of Transportation, every $1 billion investment in the nation’s transportation infrastructure supports approximately 28,000 jobs. But not all transportation projects are the same. Expenditures on public transportation yield on average 36,000 jobs, and generate $4 billion in economic return while also boosting environmental quality, improving job access for low-income people, and strengthening our sense of community. The billions we spend on transportation of all kinds will make a bigger impact on creating jobs over the long haul if we pay more attention to the kinds of places where people want to go—places that are walkable and offer a variety of things to see and do. A case in point is Dayton, Ohio, where a Placemaking approach to transportation that was led by the local transit agency led to significant community improvements that went well beyond transportation. Just a few years ago, the center of Dayton looked almost empty. With the addition of a new transit hub, Wright Stop Plaza, a busy town square was created. A waterfront park, ballpark, and performing arts center were also part of a revitalization strategy to bring more business, jobs, and transit riders to the downtown core. Head of the local transit agency, Minnie Fells Johnson, championed the unorthodox idea that public transportation should do more than move people from place to place; it should create lively gathering spots where people can interact. The agency became what Johnson calls "a connecting machine," linking people to local institutions by creating corridors of public destinations along transit routes. This innovative strategy increased ridership as well as the use of these destinations, resulting in more business, jobs, and transit riders. 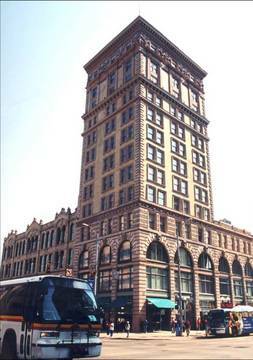 Since Johnson left the agency in 2005, her successor has completed phase II of the downtown hub regional complex. This development remains one of the finest redevelopment projects in a region that still struggles economically. By using transportation to create this connecting tissue, Dayton is now in a better position to consolidate its assets into good jobs. • Markets and Local Economies – Around the world, markets are time-honored strong economic incubators and great community gathering places. If we take the concept of a local hub of social activity and commerce and bring it to squares, libraries, schools, and parks, these places could all become catalysts for economic change and sustainability because they help growcommunities around local assets and create an atmosphere of self-reliance and support. • Inclusive Multi-use Destinations - The best destinations are those that are "owned" by people in a community. They are authentic because they are revered and sacred to the local population. As such, they have a big impact on creating local jobs. • Streets as Places - Creating a transportation system that supports the use of local places (as in Dayton, Ohio or throughout the Netherlands) can transform a city, region, or country if the transportation system is designed to connect and reinforce local destinations and emphasize walking, biking and transit, not just driving. 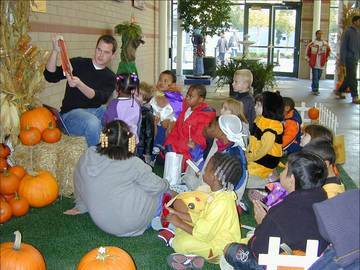 • Architecture of Place - Community institutions can be designed to take on new roles as generators of a wide range of local community activities such as job fairs, repair markets, etc. The urgent task before us now is to transform dull areas into vital hubs where connections grow and innovation thrives. These places will creating the settings for a sustainable future of healthy businesses and robust job growth.